Nuzzled away in the Fort Pienc corner of Eixample, not so very far away from the Arc de Triomf, El Puestu is one of those chic-but-chill joints that make casual dining in Barcelona such a joy. The vibe is perfect for those impromptu meetups with friends, or when you want to impress someone special while keeping things low-key. 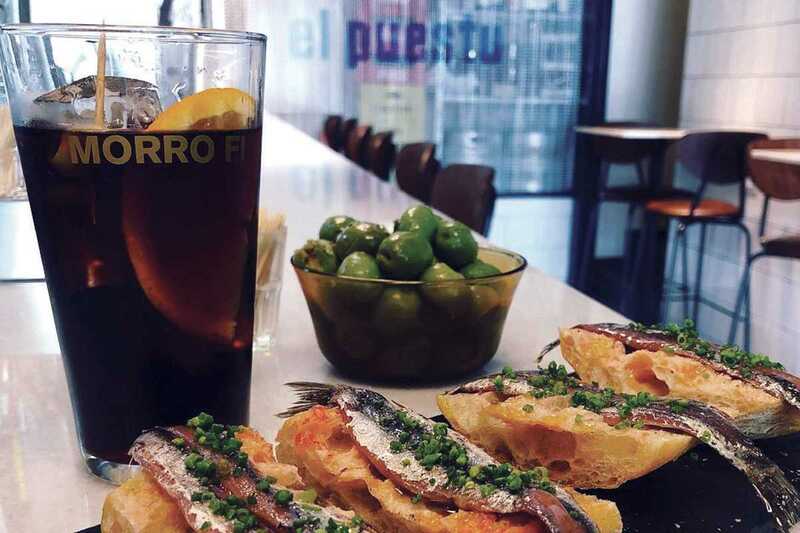 Specializing in “vins i platillos” (wines and small dishes), the menu features bold but simple dishes that rely heavily on the quality of each ingredient rather than any sort of artifice. I’m talking smoked cod with fresh tomato and A-grade olives, perfectly steamed mussels, meatballs with cuttlefish, vinegar-marinated anchovies with paprika, and a Russian salad that local foodies are already raving about. And yes, as you may well imagine, there’s great vermouth and a serious selection of natural wines from boutique bodegas. Definitely an address all discerning flâneurs should have in their mental rolodex.